This chair from Classique Furniture was seen recently at Domayne, Alexandria. Sleek design in woven black polycarbonate material. 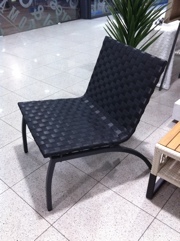 Just the chair for relaxing outside now that the weather in Sydney has started to warm up.